There are many occasions or reasons why you may wish to opt for a private tour instead of a group tour. Cars for Stars (Warrington) is perfect suited to fill the void left by so many other companies offering a pre-determined of 'off the shelf' tour rather than a bespoke one designed to suit the individual. We cover the entire WA and WN postcode area. Cars for Stars (Warrington) customers can select from a wide variety of vehicles (see our image galleries, by following the links at the head of this website) for their tour, be the preference for a people carrier, chauffeur driven car or an American stretched limousine. 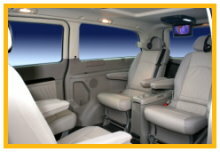 We can offer the most popular Mercedes Viano Ambiente people carrier, which can seat up to 7 passengers (sorry, no luggage) or up to 5 in relative armchair comfort (one in the front). Alternatively, if there are only 2 or 3 of you, then we can provide a top of the range chauffeur car, these are typically long wheel based versions and include the all new Jaguar XJ (LWB), Mercedes S Class (LWB) and the BMW 7 Series (LWB). If you want something a little more exclusive, Cars for Stars may be able to offer you a Rolls Royce Phantom or Bentley Arnage. We have a selection of modern stretched limousines for hire, these can be utilised for private tours and are available in a variety of exterior colours and styles. Colours include white, silver, vanilla white and black and the models include the popular Lincoln Town Car, Chrysler 300 and Hummer. Whilst Cars for Stars (Warrington) has a number of pre-determined tours, we normally find that our clients prefer to design their very own itinerary and we actively encourage this approach. If you tell us what you want to see and over what duration, we will provide the estimated journey times and determine the routes, if you prefer, we can provide 'sample' tours. Tours can be anything you want. Some of our clients may want a tour of Warrington, whilst others want to visit tourist sites, historical sites or castles. As a professional operator, we will work around what our clients are looking for, whilst remaining practical and helpful with regards to times and distances. Because our chauffeur may not be the best person to provide a running commentary on the destinations or venues selected by our customers, many will opt for a professional tour guide or, more commonly, a Blue Badge Guide. These professional guides can assist with journey planning, provide interesting facts and offer suggestions for good stopping points or overnight stays. In addition, many are bi-lingual, allowing our customers to receive descriptions and information in their mother language. For a professional tour experience, contact Cars for Stars (Warrington) on 0845 226 4196 or complete our online enquiry form. Whilst the vehicles featured on this website are available through the Cars for Stars network, they may not necessarily be operated by Cars for Stars in Warrington (for example the candy apple red limousines), in which case they may have to come from a neighbouring office which would result in a premium price. If this is the case we will let you know before you place your booking and offer you a 'local' alternative. Limousine hire, chauffeur cars and wedding cars for hire in Warrington and surrounding area. Licensed for private hire. Chauffeur Driven Tours of Warrington .::. Private chauffeur driven tours .::. Blue Badge Guides .::. Tour Guides .::. Tours of Warrington .::. City Tour Services .::. Limo Tours of Warrington .::. Warrington Stag Night Limos .::. Limos for Hen Nights in Warrington .::. Stag Night transportation .::. .::. Warrington Hen Nights .::. Warrington Stag Nights .::. Stag Nights Limos Warrington .::. Limo hire in Warrington .::. Warrington Limos .::. Chauffeur Cars Warrington .::. Wedding Cars in Warrington .::. Limo Hire Warrington .::. Bentley Arnage Chauffeur Cars in Warrington .::. Rolls Royce Phantom .::. Jaguar XJ Chauffeur cars .::. Tours in Warrington .::. Royal Ascot Racing Warrington area .::. Limos Warrington .::. Licensed Limo Company Warrington .::. Licensed Limos Warrington .::. White Limos .::. Black Limos .::. Red Limos .::. Candy Apple Red Limos .::. Silver Limos .::. Chrysler 300 Limos .::. Lincoln Limos .::. Hummer Limousines .::. Legal limousine hire .::. Prom Limos .::. Business Travel Warrington .::. Warrington airport transfers .::. Ground transportation Warrington . ::.